To commemorate the one-year anniversary of their marriage, the “Dancing with the Stars” pros revealed that they officially became husband and wife at an intimate ceremony prior to their formal wedding. In the video, Peta excitedly grinned as Maks said his vows, holding a bouquet of pink tulips in her right hand and her fiancé’s hand in her left. As he made his promises, a baby let out a quiet cry and a cell phone rang, but she barely noticed the tiny, eyes glued on her husband-to-be. When the officiant pronounced them married, Maks and Peta wrapped their arms around each other for a romantic kiss, then followed it up with a series of sweet pecks. Peta reflected on the anniversary in an Instagram post of her own. Peta and Maks’ lavish second ceremony was held at Oheka Castle in Long Beach, New York. The bride traded her blouse and wide-legged pants for an ivory ballgown; and Maks, who opted for a button-up shirt and white skinny jeans at City Hall, looked sharp in a white suit jacket and tie. Many members of their “DWTS” family – including pros Val Chmerkovsky and Sharna Burgess, and celeb contestants Rumer Willis, Nyle DiMarco and Candace Cameron Bure – were present at the big event. 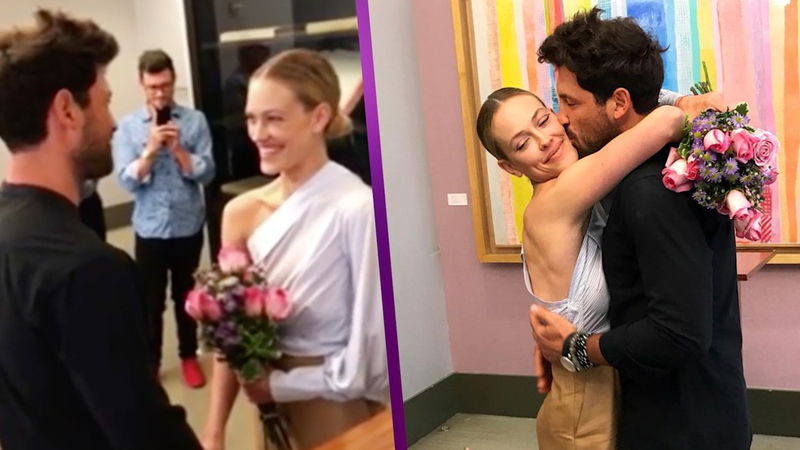 WATCH: Peta Murgatroyd & Maksim Chmerkovskiy Pack On The PDA On Tour!